Fly Jamaica Airways is continuing to face criticism for poor customer relations amidst daily flight cancellations. The airline has been experiencing difficulties following a November 9th crash-landing at the Cheddi Jagan International Airport (CJIA), Timehri, which resulted in extensive damage to one of its aircraft. However, two months after the crash, the airline has seemingly been unable to properly resume its operations as flights are continuously being cancelled, much to the dissatisfaction of ticket holders. A visit to the airline’s website yesterday revealed a public notice informing passengers that flights from Monday and yesterday were cancelled. Meanwhile, disgruntled passengers continue to vent their frustration on the airline’s Facebook page on issues related to the cancelled flights as well as others related to refunds and lack of communication from the airline. One Facebook user noted that she waited the full six-to-eight-week refund period but is yet to receive any information. “I waited the 6 to 8 weeks refund time I was offered and even after that no refund for a flight your company changed the date for. I made contact and was told it was sent to the accounts department. Then when I call [the] accounts department, I am told the request has not reached the accounts department yet? So I’m to be played right?” the woman wrote. “I remember going on a flight with JetBlue that was cancelled and they had to get me on a next flight. And you know what? I got accommodation in Kingston, they put me on a next flight and the full amount for the flight was refunded the same week,” she added. 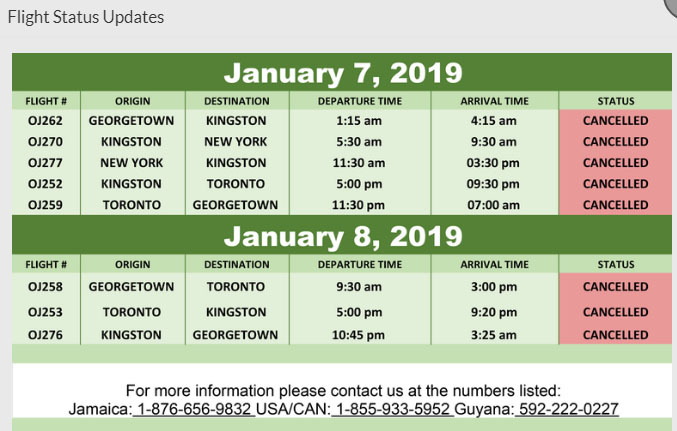 Another woman who was scheduled to return to Guyana for her wedding last week detailed her frustrations with the airline as she explained that she had been making constant visits to the airlines office only to later be told that flights have been cancelled until January 11th. She contended, too, that because of the lack of communication from the airline, other carriers have hiked their ticket prices. 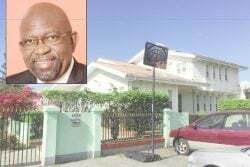 Attempts were made to contact Fly Jamaica for a comment. 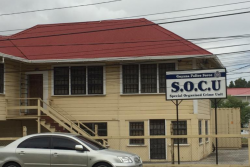 However, this proved futile as calls to the numbers listed for the Guyana office went unanswered. Similarly, calls to the reservation office were met with an automated voice message informing callers that the reservation office was closed even though the call was made during the operation time stated by the voice message. The airline sought to lease planes to continue serving its passengers as a means of cushioning the load of the demanding Christmas season in December. Later in the month, the airline announced that it was taking steps towards compensating passengers who suffered losses during the November 9th accident. 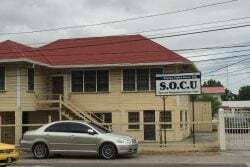 The airline, in a public notification, said it was continuing to support passengers who were on board the November 9th flight and was inviting those who may have suffered losses to contact their local Fly Jamaica office to discuss whether they may qualify for reimbursement or other compensation. 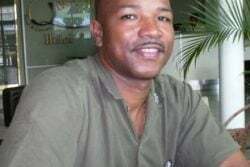 “Now that the immediate post-incident travel and accommodation needs of our passengers have been met, Fly Jamaica has begun the process of interfacing with customers to ensure that, if they have suffered loss, they can be fairly and reasonably compensated in line with accepted principles of aviation international law and our own corporate responsibility,” said the airline in its the notification. Six people were injured when the Toronto-bound aircraft with 118 passengers and eight crew members aboard made the emergency landing at the Cheddi Jagan International Airport, Timehri. An 86-year-old passenger died a week after the crash. Two class action lawsuits have been filed for injuries and losses sustained in the crash on behalf of passengers in Canada.